Our all-time favorite temporary file cleaning tool CCleaner has just been updated by its parent company Piriform. CCleaner 3.2 introduces several improvements over previous versions, including full support for Microsoft's Windows 8 Release Preview, and a new context menu editor that allows you to manage third party context menu items in the program interface. Existing users of CCleaner can check for updates from within the program window, or download the latest version directly from the Piriform website. Here it is as usually offered as a setup or portable version (if you click on the builds page link at the bottom of the page). Most of the changes in this release, besides the already mentioned ones, have been under the hood changes that improve or add compatibility with programs like Opera 12, Firefox Aurora or Google Chrome Canary. The developers furthermore have improved several program modules like the Task Scheduler or duplicate detection algorithm. You can read up on all the changes in this release by following the link posted above. To access the new context menu editor, you need to click on Tools > Startup, and there on the Context Menu tab. 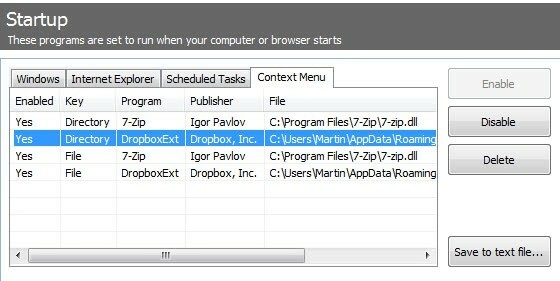 Here you see a list of third party Windows Explorer context menu items that you can disable or delete. Disabling basically hides the context menu item when you right-click, which may be the way to go forward if you are not sure if you still need - or may need - the context menu item at a later point in time. Program, publisher, file and key information are displayed for each item, so that it is quite easy to identify the items in the context menu. Most of the remaining improvements have just been added to the core program. This includes the previously mentioned Windows 8 and Opera 12 support, as well as improved history cleaning for Aurora and Canary. This will be handy, thanks for the headsup. One thing I’d like to work out how to do is change context menu so that rather than expanding vertically, each software lists its options in a sub folder list (bit like the old windows XP start/all programmes), that way, most options could be retained without pushing common functions like “delete file” off the visible screen. I always go to the Pinform download page to find the portable version. But it takes a bunch of clicks form the File Hippo RSS feed to get to the portable version. I don’t know why Pinform or File Hippo can’t make it easier to get to the portable version! Maybe because clicks, or page views equal money. Why not click on Check for updates from within the program? That’s exactly what it means! Very strange that some programs show up 3-4 times in the Context Menu. Just got 3.20 Portable a few minutes ago!